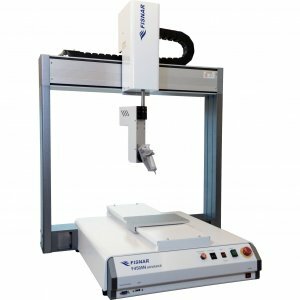 Combined with our dispensing products, the benchtop fluid dispense robots will deliver an accurate, repeatable and consistent application process. 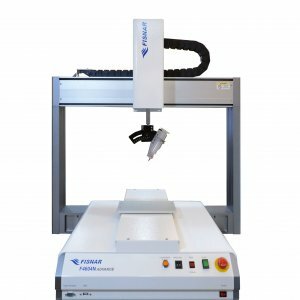 Programming is simply carried out by a teach pendant (included) using the industry’s leading dispensing software that walks the user through step-by-step instructions to create a sophisticated dispensing operation in minutes. 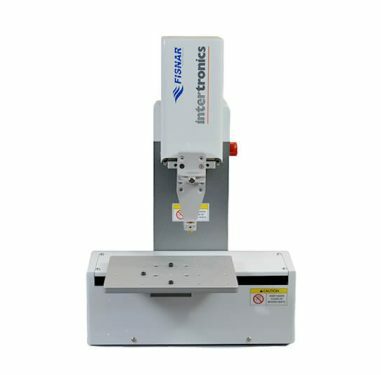 The series includes a range of three-axis, four-axis and five-axis benchtop dispensing robots, which offer varying workspace sizes to meet the requirements of your application. 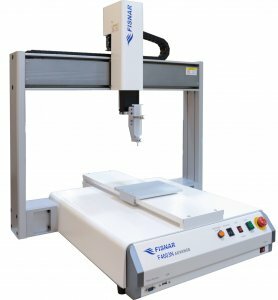 The largest workspace available is 600mm x 500mm offered by the three-axis FISF4603 and four-axis FISF4604. 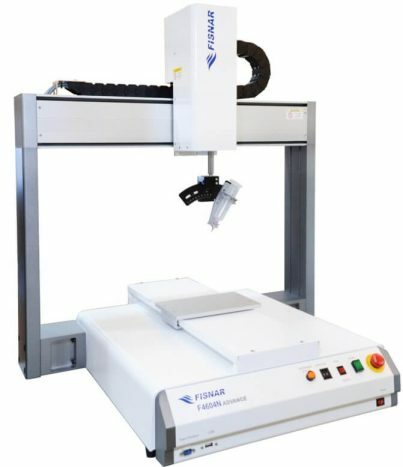 The modular connectivity design of the Fisnar F4000 ADVANCE series offers easy configuration with optional robot accessories such as Tip Alignment Kit, Height Sensor and CCD Camera Vision System. 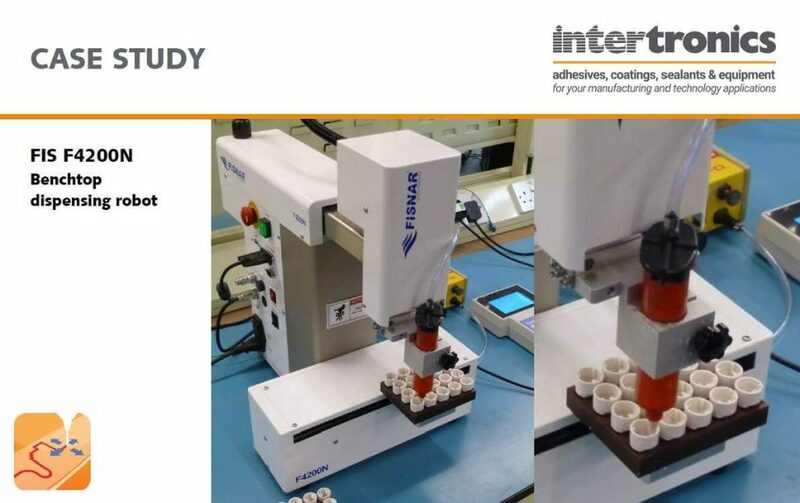 We will help you to evaluate and select the most efficient and cost-effective dispensing system for your application and process and support you through integration and training to get you up and running a quickly as possible. 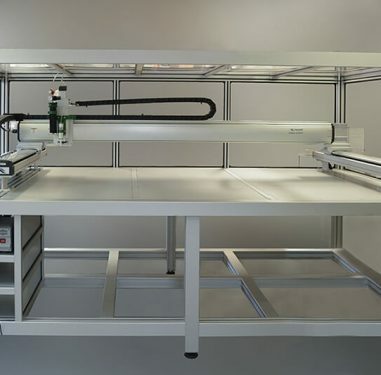 We are able to provide complete dispensing systems to include any required dispensing valves and pumps, material feed reservoirs and robot safety enclosures. 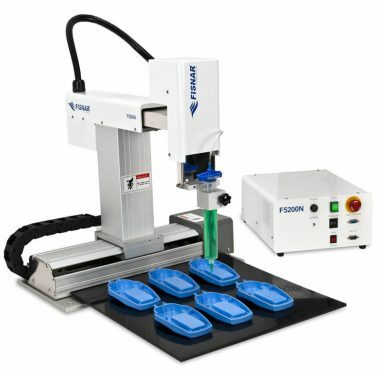 Dispensing equipment can be easily integrated with curing or surface preparation equipment to improve your process. These dispensing systems are examples of such integrations. We would be pleased to help you put together an integrated automated dispensing system customised for your particular needs. 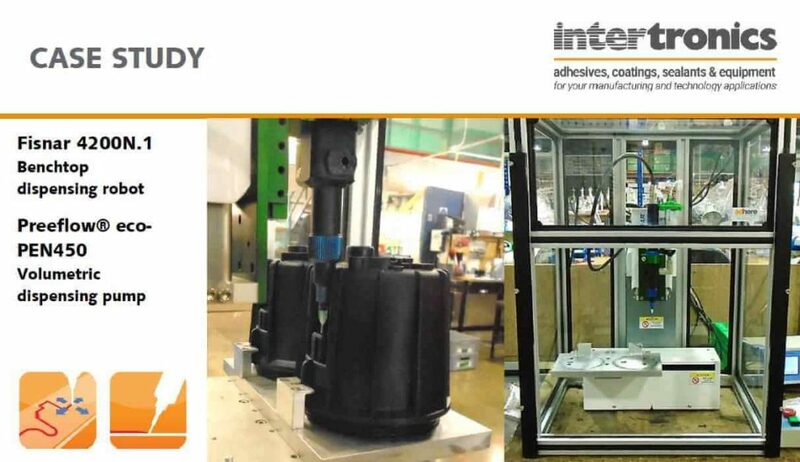 The automation of any manual dispensing application can be easy to justify, with a quick return on investment (ROI). 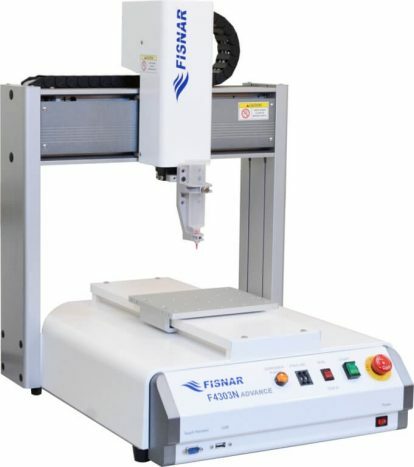 The Fisnar F4000N ADVANCE series handles dispensing areas from 300mm x 300mm to 600mm x 500mm and is capable of storing up to 100 different programs. Step-by-step intuitive instructions simplify job creation tasks, allowing a program to be entered and running in minutes. A 16-channel I/O interface provides for communication with external devices for secondary applications and multiple dispensing equipment components. A Windows software package with a DXF file converter is available for programming from a computer. A compact, robust, heavy-duty design (cast construction) provides stability when working to fine tolerances. The robots are three, four and five-axis design and are capable of interfacing with any INTERTRONICS dispensing equipment. 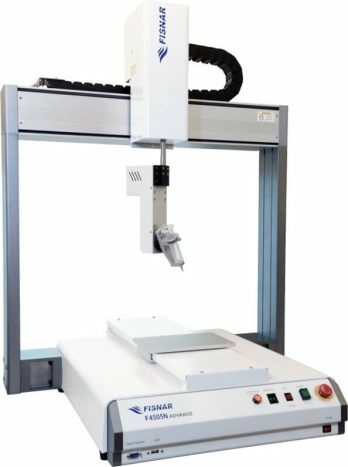 The F4000N ADVANCE series can be used with simple dispensing barrels, controlled by a pneumatic dispenser, or a dispensing valve, fed from some form of reservoir. Please contact us for a full discussion of your requirements. Programming is simple with easy to follow English language instructions. Commands are followed and responses entered by a teach pendant. An LCD display prompts the user for a data input and once confirmed, automatically displays the next instruction. By this method a program can be created quickly and simply. 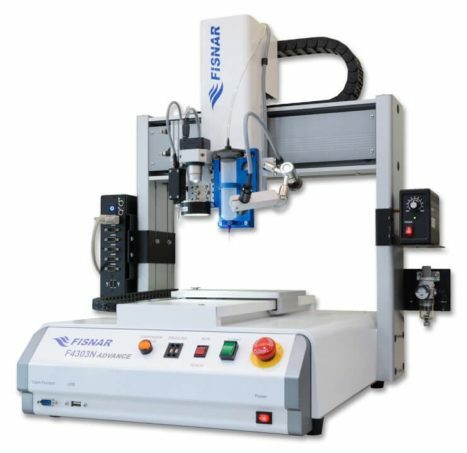 For older FISNAR models, upgrade kits are available making them compatible with all of the above accessories. 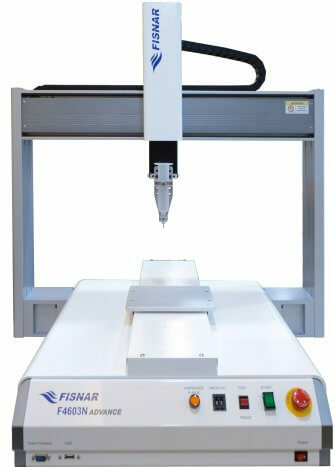 Please contact a member of our technical sales team for further details on robot upgrades. Enclosure A range of safety enclosures are available with light curtains or interlocked doors – benchtop or freestanding. 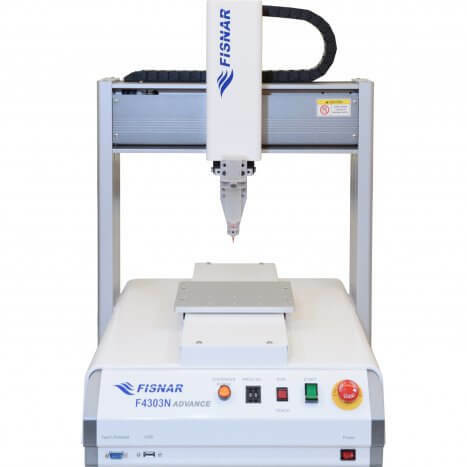 The Fisnar F4200N.1 is a compact and economically priced benchtop dispensing robot for automatic application of adhesives, coatings, gaskets, sealants, and inks. 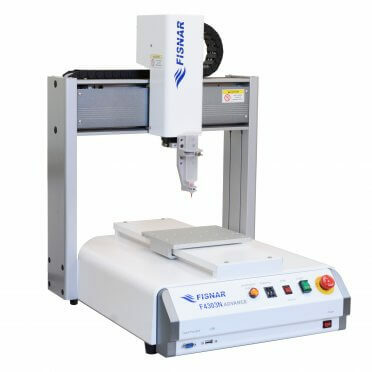 It is designed for manufacturing, medical and laboratory environments requiring a streamlined, robust and easily maintained machine.